“To live with the Santa Ana, is to accept consciously or unconsciously, a deeply mechanistic view of human behavior,” reflected Joan Didion in 1968. Quoting Raymond Chandler, she noted the environment’s deterministic control over Californians. On nights when the Santa Ana gust through the homes of Angelenos, Chandler asserted, “every booze party ends in a fight. Meek little wives feel the edge of the carving knife and study their husbands’ necks. Anything can happen.”1 Though the winds alone might have inspired unpredictable behavior in people, every year from October through January, the Santa Ana’s love affair with fire existentially pokes Los Angeles like a carving knife to a husband’s neck. The 1956 Malibu fire consumed 26,000 acres, 100 homes, and one life. Two years later another blaze destroyed 74 homes, but spared lives. Unfortunately, twelve years later in 1970, another wildfire killed ten people and decimated over 400 homes. 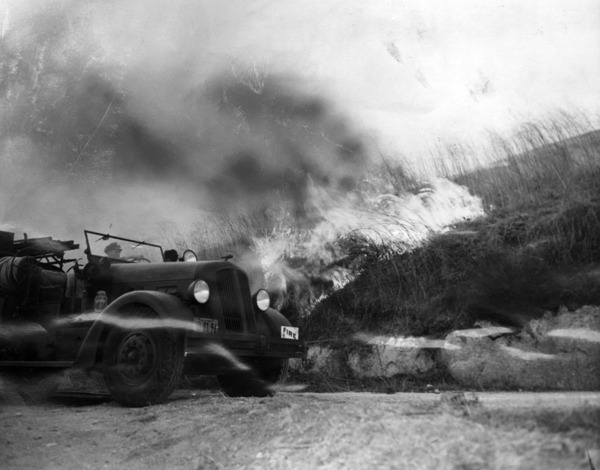 Moreover, one could easily go back decades earlier to the 1930 Decker Canyon inferno that, facilitated by a “fierce Santa Ana,” engulfed 15,000 acres and, as Mike Davis notes, left firefighters facing a five mile wall of flame with little more to do than “save their own lives.”4 More fires followed in 1935 (30,000 acres), 1938 (14,500 acres), and twice in 1943, in October and November (over 20,000 acres in total). This is to say nothing of smaller outbreaks like Topanga Canyon’s 1961 wildfire (8,000 acres). 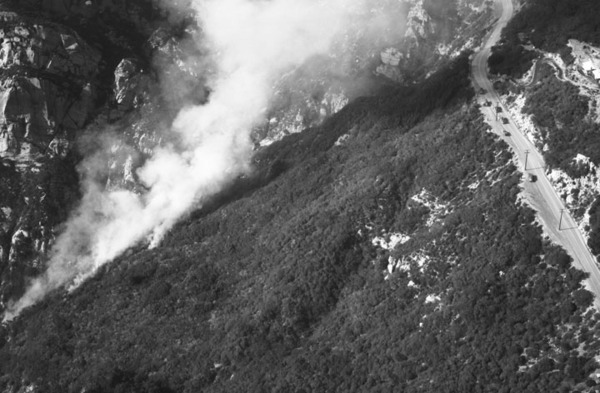 In 1978, just after Didion had sold her Malibu house but had yet to move out, a brush fire in the San Fernando Valley, spread by the Santa Ana, carried the fire over 25,000 acres and thirteen miles to the coast. Aided by 100 mile-per-hour winds, the wildfire jumped the Pacific Coast Highway. Temperatures reached 2500 degrees Fahrenheit. “Horses caught fire and were shot on the beach, birds exploded in the air,” Didion recounted. “Houses did not explode but imploded as in a nuclear strike.”5 In the end, the 1978 fire scorched 25,000 acres, destroyed 230 homes, and claimed two lives. This year marks the 35 years since of the Agoura-Malibu Firestorm of 1978, and twenty since the devastating 1993 Malibu conflagration. Moreover, in the wake of Arizona’s recent wildfire tragedy in which 19 skilled wilderness firefighters lost their lives, Malibu’s history, as noted by Davis, reminds us of the dangers not only for homeowners and residents, but for those battling the recurring flames. Didion described the fires, earthquakes, and mudslides of Los Angeles as “the weather of catastrophe, of apocalypse,” its violence and unpredictably wreaking havoc on the frayed nerves of Southern Californians.6 Still, for all her brilliance, Didion seemed to assign blame for Los Angeles’ “weather of catastrophe,” specifically the mercurial Santa Ana winds and their nefarious influence, to nature alone, a point Davis places under great scrutiny in “The Ecology of Fear” and that the recent Arizona fires also question. As of 2010, 98.5 million people resided in 43.7 million homes located in the wildland-urban interface (WUI), where houses “mix or border flammable vegetation.” Malibu’s wildfire history provides a useful point of reference for Western America’s seasonal threat. 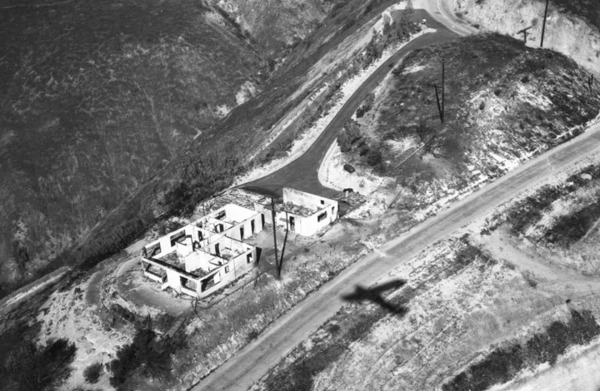 Just before the massive 1930 Decker Canyon fire, the legendary architect and landscape designer Fredrick Law Olmsted Jr. had suggested, in great part due to the area’s tendency to burn, public ownership of 10,000 acres of many of the most attractive beaches and mountains that lay between Topanga and Point Dume. Olmsted’s attempt amounted to what is known as “fire hazard zoning,” which, at the risk of summarizing too simplistically, amounts to establishing greater distances between forests and subdivisions. Real estate forces proved too powerful however, as developers’ formidable enthusiasm for expansion into Malibu’s coastal areas overwhelmed Olmsted’s vision. Despite three more fires in the 1930s, the city passed on an 1938 opportunity to buy 17,000 acres of land in return for waving $1.1 million in delinquent taxes from the bankrupt Rindge Estate, forcing the owner, “Queen of Malibu” May Rindge, to put it on the auction block where developers and others descended.7 With more development, fires threatened more property and more lives. Of course, with California’s population boom and suburban expansion, fires grew increasingly common. Throughout the 1980s, not counting national parks and military installations, the state endured 10,000 fires annually. With more and more suburban development occurring in firebelts, in designated areas known to be susceptible to periodic fires, costs have risen and homes have burned. Since the state began to document homes and residences consumed by wildfire in 1923, two thirds of all those destroyed did so in 1980 or after.8 Malibu kept up with this pace, witnessing blazes in 1982 (44,000 acres and 17 homes in Paradise Cove) and 1985 (over 11,000 acres), though the source of the latter, really a combination of two fires, was later proved to be arson. Of course, then came 1993. “This is Hell dude … I’m expecting to see Satan come out at anytime now,” one retreating resident told the Los Angeles Times, as one of Malibu’s worst wildfires torched the ever vulnerable community. The exodus from Malibu provided a tragic and unusual scene as the odd movie star fled amid a sea of relatively common folk. Beginning on November 2, seven days of fire singed over 16,000 acres, left 769 homes in ash, and resulted in three deaths. Private property damages reached $208,000,000; public property a much smaller but still significant $10,800,000. In the intervening period between the fire and the 1997 discovery, Malibu focused its ire on activists who wanted to increase public access to local beaches. Some more strident residents, Davis argues, demanded greater access restrictions to mountain roads in periods of fire danger and conflated open beaches with freedom for arsonists. More critical outside observers argued that Malibu’s development unfairly burdened taxpayers. After all, through the California Fair Access to Insurance Requirements Plan (California FAIR Plan), homeowners could obtain insurance in areas that, due to vulnerability to wildfire, could not be otherwise insured. Passed in 1968, the plan originally focused on providing insurance to redlined urban communities. Inner city homeowners and businesses unable to obtain insurance due to the combination of racially discriminatory federal policies and private industry practices would be able to do so. Later, legislators expanded the plan to include those living in “hard to insure fire risk areas.” By November of 1993, California FAIR plan covered 26,000 homes in the Santa Monica and San Gabriel Mountains at an average of $718,000 per home, with an average annual premium of $715. A house on Melrose Avenue, near a fire station one writer noted, would require a $600 premium. At the time, television coverage exacerbated tensions over such issues. “These are very expensive houses,” noted one KCAL reporter. “And officials tell me each lot is worth several million dollars. So a lot out here is at stake.” Howard Rosenberg acerbically asked, “[I]s there a correlation between tragedy and property values?” Undoubtedly, Malibu contained and continues to house its share of renters and average folk. Plenty of people, Robin Abcarian pointed out in a 1995 column, lived “cheek to jowl” in Malibu shanties “in exchange for the privilege of being able to gaze out the window at one of the most magnificent natural tranquilizers the world has to offer: the rolling, hypnotically beautiful Pacific Ocean.” Even a recent New York Times article noted as much, but whatever one’s economic and proprietary status, some critics saw flaws in protecting property against inevitable fires. Years later Secretary of the Interior Bruce Babbitt, among others, wondered aloud just why we insured such areas. “If these Malibu residences that are periodically destroyed were in a 20-year floodplain, they would never have been rebuilt or reinsured,” he opined in 1999. Predictably, other fires followed: the aforementioned 1996 fire in October and three more in 2007 (January, October, and November). As noted, the 1996 blaze could be laid at the feet of Con Ed, while the October 2007 fire resulted from the toppling of three utility poles under the purview of several businesses, including Verizon Wireless, AT&T Mobility, Sprint, Con Ed, and telecommunications company Next G Networks. Next G agreed to a $14.5 million settlement divided between an $8.5 million contribution to California’s general fund and $6 million to inspect its connections to other poles in the region. In addition, Verizon, AT&T, and Sprint paid $4 million each for their own culpability. “It’s hard for people who have not lived in Los Angeles to realize how radically the Santa Ana figures in the local imagination,” asserted Joan Didion.14 Raymond Chandler believed the Santa Ana carried malevolence to the bedrooms of Southern California, and we know it brings fire to even the most decadent of homes. Though some might argue the winds ferry the highly flammable idiocy of drunken beachgoers, the dangerous militancy of radical environmentalists, or the dysfunction of the homeless to the homes and hills of places like Malibu, one might also argue that they simply breathe terrible life into the spark of conflict emitted when residential development rubs up against, and in this case also fuels, recurring events of nature. Much as it has for decades, the burning will continue, but so to will the recriminations. 1 Joan Didion, Slouching toward Bethlehem, (New York: Farrar, Strauss, and Giroux, 1968) pg. 217-218. 3 Mike Davis, The Ecology of Fear: Los Angeles and the Imagination of Disaster, New York: Vintage Books, 1999) pg. 97. 4 Mike Davis, The Ecology of Fear: Los Angeles and the Imagination of Disaster, New York: Vintage Books, 1999) pg. 104. 5 Joan Didion, The White Album, (New York: Farrar, Strauss, and Giroux, 1979) pgs. 222-223. 6 Joan Didion, Slouching Toward Bethlehem, pg. 220-221. 7 Davis, The Ecology of Fear, pg. 105. 14 Joan Didion, Slouching Toward Bethlehem, pg. 220. This article was originally published on KCET Departures under the Intersections column in July 2013. Prev What Does Woodward’s Origins of the New South Have to Say to the Twenty-First Century Reader? Southern California’s climate is extraordinarily mild. I lived in San Diego for 8 years and I have difficulty remembering when certain events happened in my life because the weather never changed. Weather serves a signpost in our lives and those signposts are often not present if you live in Southern California. In San Diego, one 72 degree day blends into another. If people did not put up holiday ornaments you would never know that it was December. There is only exception and it is an important one, the Santa Ana winds. The Santa Ana winds blow hot air from the desert towards the coast. Temperatures across southern California shoot up dramatically when Santa Ana winds begin blowing. The Santa Ana winds can occur anytime of year. The hottest day I experienced in eight years of San Diego was in February. Unfortunately, wild fire often accompany the winds. I remember waking up in October 2003 and the sky had turned orange. A few days earlier on October 25th, the Cedar Fire broken out east of San Diego, near Ramona. Within a few days San Diego was covered with a thick layer smoke. Ultimately, the fire consumed 280,000 acres, destroyed 2,820 building and tragically killed 15 people. It was the worst fire in California history. 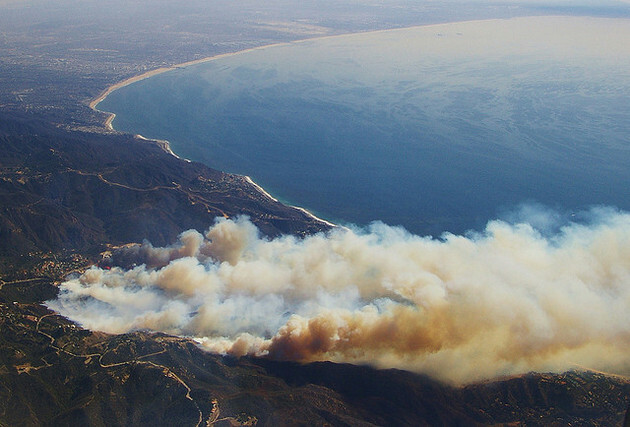 Despite the mild climate, Southern California is a desert and wildfires are constant threat. Ryan Reft at Tropics of Meta has an article about the Santa Anas and Malibu, the tinderbox of Southern California. He explores the almost mythic nature of the Santa Anas. Malibu has been repeatedly burned to the ground by wild fires stoked by Santa Anas. If Malibu was not pressed up against the Pacific Ocean in such a stunning location it would have been abandoned years ago because of the wildfire threat. Unsurprisingly, humans magnify the threat of the threat of Santa Ana wildfires. We repeatedly build homes in places like Malibu and provide fuel for monster fires. Reft examines the remarkable ability of humans to ignore serious and life threatening environmental threats in his post.